The following is an account from the Museum Collections Unit, University of St Andrews, on how an AIM conservation grant of £1,500 has helped to preserve Indian paintings on glass. The University of St Andrews was founded between 1410 and 1414 and has accumulated artefacts of significance since this period. The Museum Collections Unit exists to manage and preserve the collections in its care and to make these collections available to the academic, scholarly and general public by study, publication and exhibition. The Museum Collections Unit was awarded an AIM Conservation Grant to support the conservation of a collection of rare Indian paintings on glass. The glass paintings depict Hindu deities and are thought to have been executed in Southern India, probably Tanjore, in the mid-19th century. The paintings are displayed inside wooden frames and the decoration has been painted directly onto the surface of the glass using gouache and gold leaf, which was likely bound in a gum arabic solution. The collection was presented to the University of St Andrews in the late nineteenth century by the Reverend Augustus Clifford Bell (1832-1874), who was a graduate of the University. Reverend Bell was Chaplain of the Church of Scotland St Andrews Church, Madras, from 1860 to 1874 and it is believed that he may have collected these paintings during this period. These paintings are significant not only for their artistic merit but also because of the valuable insight that they provide into material culture and cultural relations between Indian craftsmen and the British in the 19th century. These pieces were produced by Indian artists for British patrons. Works of this type are often referred to as ‘Company Paintings’ because many of these patrons worked for the various East India companies. Due to the fragility of their construction and often because of their religious subject matter, it was very rare for travellers to bring glass paintings back to Britain. Before conservation, the glass paintings were in a very fragile condition. It was feared that the areas of painted decoration within the remaining eight glass paintings were in danger of being lost due to the deterioration and flaking of paint away from the glass surface. The paintings were also loose and unstable within their original wooden frames. With the assistance of an AIM grant, the Indian paintings on glass have been conserved. This complex conservation project was carried out by an ICON-accredited stained glass conservator, Mr Mark Bambrough of the Scottish Glass Studios. The basis of this conservation approach was adapted from an article entitled ‘Conservation of Indian Mica Paintings’ in the Conservation Journal (Summer 2000, Issue 35), published by the Victoria and Albert Museum. Seven of the painted glass panes were removed from their wooden frames and placed inside a fume cabinet and sprayed with a consolidant (5% Paraloid B72 and Acetone). This process secured the loose paint fragments and gold leaf back to the glass panels. The glass panes were then returned to their frames in a way that prevented further movement of the painted panels and abrasion against the original wooden back board. This was achieved by placing a sheet of acid-free brown paper and polyethylene foam between the painted panel and wooden backboard to create a physical separation between the two surfaces. The glass panes were then secured inside the frames by using small pieces of polyethylene foam to hold the glass in place and prevent any horizontal movement inside the frames (please see enclosed photographs documenting the individual processes). One of the glass paintings, a panel depicting Vishnu, had been badly broken in the past and held together using non-conservation grade tape and mount board. This panel was carefully removed from its backing board and bonded together using conservation grade resin to create one single decorated pane. The assistance of an AIM Conservation Scheme grant has enabled the Museum Collections Unit to conserve the Indian paintings on glass in order to preserve and promote public access to this rare collection. We are delighted that this vital conservation work has secured their future for the benefit and appreciation of museum audiences for generations to come. The first in a series of AIM ‘Stop the Rot’ collections care workshops took place last Friday at the Firing Line Museum in Cardiff. AIM is running these workshops at several locations across the UK in the coming weeks thanks to funding from The Pilgrim Trust and there was a real sense of excitement in the air as everyone who had booked onto the Cardiff workshop arrived and took their places in the wonderful meeting room at the museum. Goody bags at the ready! A series of fun tasks and quizzes followed which all helped to take the fear out of conservation techniques and Jane gave some interesting facts and historical references about collections care from over the centuries. Attendees were also presented with case studies of when things go wrong in a museum – such as fire, flooding and theft – and how carefully thinking through the implications of collections care can help to reduce risk to objects. After lunch, the attendees spilt into groups to explore Firing Line and exchanged ideas on how different displays could be cared for, followed by a ‘pest identification’ quiz using pest posters kindly donated by English Heritage. An explanation of how to use the different items in the free delegate packs and a run through of the AIM Success Guide ‘Successful Collection Care’ accompanied by tea, lively chat and biscuits completed a lovely day of training. Jane did a great job of demystifying the basics of collections care and the feedback from the attendees was positively glowing with remarks including: “I really enjoyed the hands on tasks and will use my new skills every day at my museum”, “I now have a much better understanding of collections care – thank you!” and “I am going to use tips I discovered today to make the right changes at my museum”. A peek inside the workshop goody bags! AIM would like to thank: Jane Thompson – Webb, The Pilgrim Trust, Christopher Dale, Rachel Silverson and team at Firing Line, all Cardiff workshop attendees and the regional MDO teams for their support and promotion of these workshops. 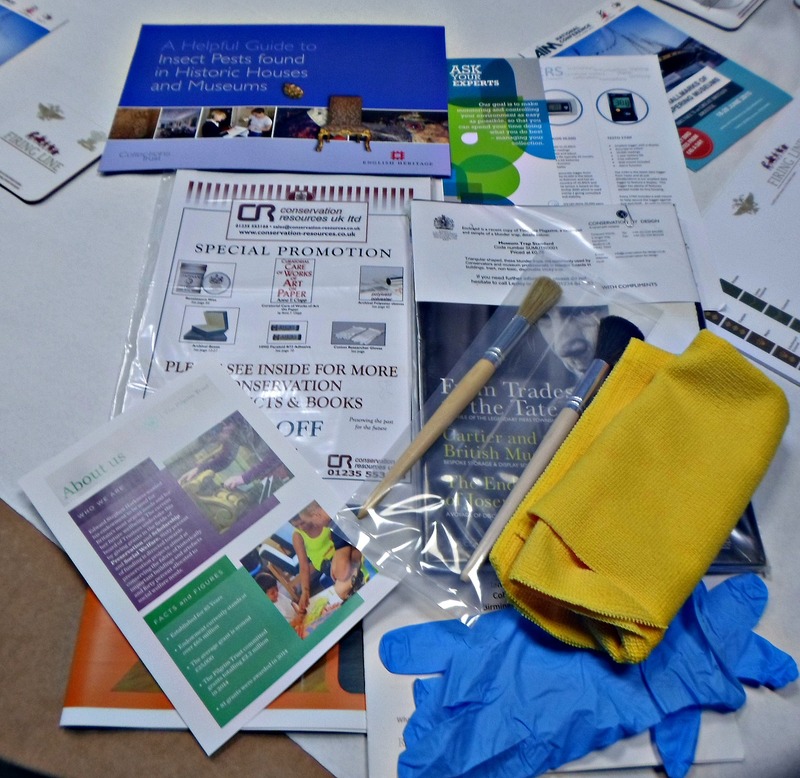 Stop the Rot delegate packs contain items from: English Heritage, Conservation Resources, Conservation by Design, Meaco Measurement and Control and Edward Mason brushes. The Collections Trust, with funding and support from Arts Council England, has developed a series of free seminars that will provide you with the know-how to improve the use of technology in your museum and assist you with your collections development strategy. The first seminar will take place in London on 6 October 2014. Book your free place now! The seminars are aimed at Collections Management professionals and volunteers who work in small and medium-sized UK museums that are Accredited or that are working towards Accreditation. The Collections Trust and Arts Council England are delighted to launch a joint initiative to pilot a Collections Management Traineeships programme for the museum and heritage sector. A video introducing the programme is available on the Collections Trust website. via Collections Management Traineeships – Collections Trust. The Collections Trust would like to invite AIM members to join us for a free webinar on ‘Buying Collections Management Software’ led by Nico Tyack, Documentation Officer at Edinburgh City Council. The webinar will take place online between 12.00-13.00 GMT next Thursday 27th March 2014. It is completely free to attend, but you are asked to register in advance to ensure we have record of numbers – registration only takes a moment and can be done by emailing events@collectionslink.org.uk. Full information about the webinar is available on Collection Trust’s website at http://www.collectionslink.org.uk/buying-collections-management-software. This webinar is part of a programme of work coordinated by the Collections Trust which aims to help museums choose the right Collections Management software for their needs. It is a companion to the popular Collections Management Software Survey which is completely free to use and available at http://www.collectionslink.org.uk/softwaresurvey.